Radiating class and elegance, this Platinum Overlay sterling silver ring is a visual delight. Set with 5 Arizona Sleeping Beauty Turquoise (Rnd 1.25 Ct), this ring sits pretty on your finger. The 3.750 Ct, five-stone ring has a classic design that will never go out of the trend. The stones are set in graduation that adds to its beauty. Sleeping Beauty Turquoise boasts a rich blue shade that has a clear and vibrant hue just like the expansive skies of the West. Arizona Sleeping Beauty Turquoise Round 7 Cabochon 1 1.250ct. Arizona Sleeping Beauty Turquoise Round 6 Cabochon 2 1.500ct. Arizona Sleeping Beauty Turquoise Round 5 Cabochon 2 1.000ct. Verified reviews of SLEEPING BEAUTY TURQUOISE (3.75 Ct) Platinum Overlay Sterling Silver Ring 3.750 Ct.
Bezel settings show off the turquoise to advantage. Looks far more expensive than it is. Very nice ring with beautifully matched, stunning S.B.Turquoise. 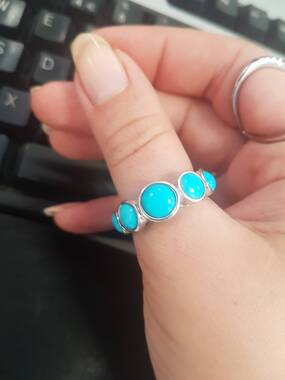 Bought to wear on index finger, and think would not be very comfortable on any of the middle fingers due to the stones set down the side digging in! Absolutely love the colour! It's a beautiful ring. Slightly bigger than expected on my my finger. So I wear it as a thumb ring. Still looks fabulous. Arizona Sleeping Beauty Turquoise (Rnd 1.25 Ct) 5 Stone Ring in Platinum Overlay Sterling Silver 3.750 Ct.